I have to admit to not really knowing what I was going to do in this match, the pond is changing and evolving all the time and whereas last year the top tactic was fishing the short pole to hand and catching loads of small fish including the odd bonus, this year the small fish aren’t as prevalent and big fish are dominating with peg 1 the place to be. I got to the Bowling Club nice and early, in fact me and Steve P were the first ones there (which is unheard of for me!) and he paid his pound from the last match to get the day off to a great start. Another fantastic breakfast and I hoped the day would continue in a similar positive vein. 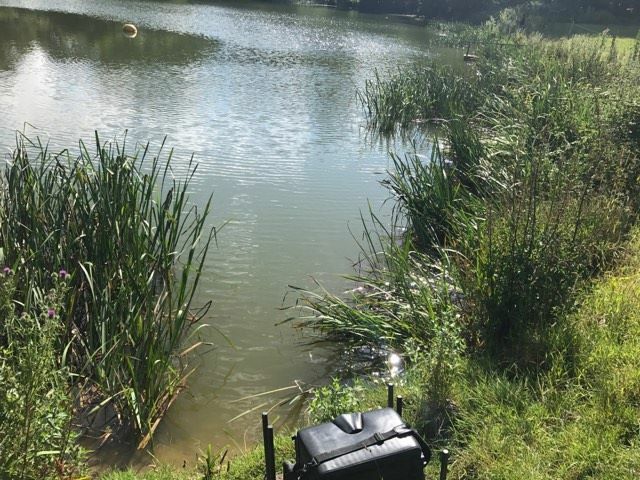 The other anglers started arriving and its great to see the pond becoming so popular with 18 anglers booked in, the only downside is that the pond doesn’t tend to fish so well with a lot of anglers on it and scorching hot and bright conditions wouldn’t help either. It was soon time to draw and everybody was hoping for peg 1, I pulled a ball out but didn’t look, Jeff Sparkes was on 22 which isn’t great, Justin Charles was fishing his first match on the pond this series and pulled out peg 6 on the far side which is a great area and then, incredibly, Adie Bishop pulled out peg 1 for the second match on the trot and Bill was on peg 2 next door. 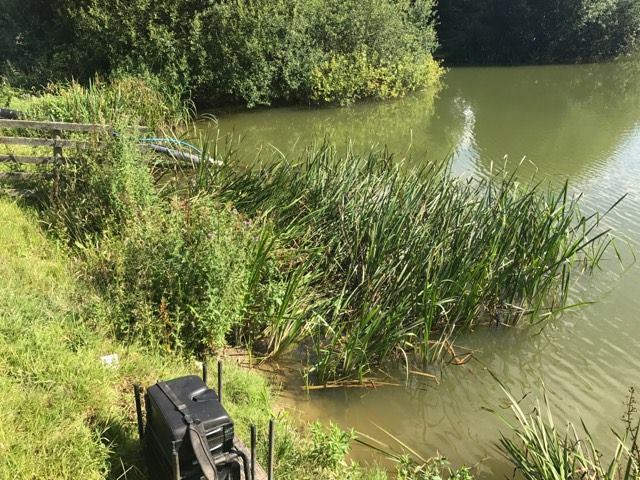 I had a look and saw the number 23 which hadn’t been in so far this series, it’s not a great peg at all, along with 22, it’s up the arm off the main bowl of the lake and I felt like going home, worse still I’d have to watch Adie bag up all day! I got to my peg and just couldn’t believe it when I saw 24 by the bush wasn’t in, still on the plus side I’d just be able to reach the bush with 16 metres of pole but it would be hard work. Jeff discovered the electric fence was on when he got a jolt as his day went from bad to worse, we decided to have a pound side bet as that would be the only chance of us seeing any coin today. The peg is even cut out at a funny angle so you’re fishing almost parallel to the bank! The view to my left, even if you hook a chub at 16 metres you have to get it away from the bush and then navigate it around the irrigation pipe and reeds! 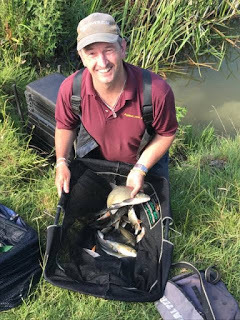 First job as always was to mix up some groundbait and today I was using Pro Natural Dark and Special G Dark, then I set up four rigs, a top kit to hand rig, a 0.5 gram Drennan Roach for fishing at 10 metres, a little Preston Chianti for up in the water and finally a Carpa 2 for by the bush. On the side tray I had maggots, casters, hemp and corn. 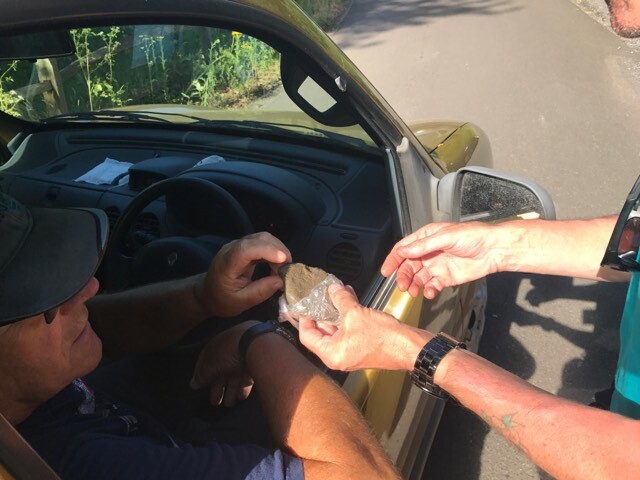 Rob got us underway and I cupped in two balls of groundbait at 10 metres before putting in a ball of groundbait followed by a pot of corn, hemp and casters by the bush which was bloody hard work as my pole gets rather unwieldy at that length! I started at two sections to hand but knew we were going to struggle when I couldn’t get a bite! 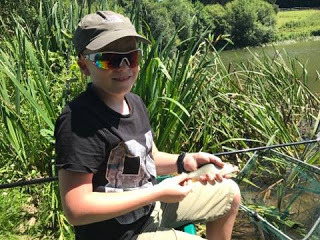 After 15 minutes I’d only had a couple of tiny roach, I added a section but that was no better and I only had one more roach, Jeff was also struggling but Adie was getting a few fishing shallow. I moved out to 10 metres but the float just sat there, I was feeding hemp and casters but there were no swirls and even at this early stage I was fearing the worst. I had a couple of roach and Jeff had landed a chublet but Adie had already landed a good fish. The next bite resulted in a decent fish tearing off and after initially thinking it was a chub, it stopped and it felt foulhooked, I carefully shipped back expecting it to come off at any minute but eventually reversed a pound skimmer into the net – bonus! 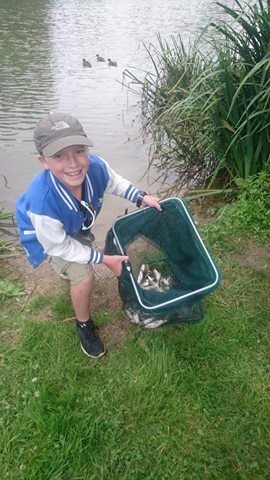 Jeff had a skimmer but Adie had now landed several big chub and bream and was out of sight already, Bill had landed a couple of skimmers and apparently Alvin down on peg 10 had landed a couple of bream. With only an hour or so gone, it felt like I needed big fish to compete so I slipped a grain of corn on and went out to 10 metres, I didn’t have to wait long, the float disappeared from view and the strike was met by solid resistance, the fish headed off to the left and with the light elastic in I couldn’t do anything, I stood up and gave it as much stick as I dared but it went under the pipe or in the reeds and the 0.10mm hooklength gave way. I switched to a heavier elastic and 0.12mm but never had another bite there, I tried shallow and had one 4oz chublet but with two hours gone, Adie probably had 25lb already whereas me and Jeff had about 1.5lb each. I cupped in two more balls of groundbait before sticking on the rest of my pole and going over by the bush, with Adie catching well I was sure I’d hook a couple (getting them out might be a different matter) but I never had a bite there so as the half way point approached I was all out of ideas and not enjoying myself at all. I went back to fishing corn on the 10 metre line and was sure I’d hook one sooner or later but it didn’t happen, out of boredom I was about to have another go shallow when Jeff hooked and landed a decent chub and it was looking like I’d be at least a pound down to top off a miserable day, he even started saying he wanted a nice shiny new one and not one of the old ones! So I stuck it out for a big fish but it wasn’t happening and another brief go at 16 metres by the bush was a waste of time. Adie was still catching well and on for another big weight and Bill was netting fish too. Hurf turned up for a walk and said nobody else was really catching so I went back out with the shallow rig but added a couple more sections and just as Hurf was heading off the float buried and I landed a 4oz chublet. It wasn’t fast or furious but I started to make inroads into Jeff’s lead and was wishing I’d done it earlier, I looked up to Bill’s elastic stretching halfway across the pond as one of the venues rogue carp made a (successful) bid for freedom. During the last hour and a half or so I had about ten chublets (and bumped a couple) to boost my weight by 3lb and Jeff said I’d beaten him but I wasn’t so sure. I packed up and I apologise in advance for the lack of photos as I thought Rich S would start the weigh in with me but he actually went to the other end first. Looking at the weighboard it had been rock hard with Jess leading the section with 8lb 9oz from peg 13 followed by Fieldy with 4lb 14oz. Jeff had 3lb 14oz and I thought it would be close but my 18 fish actually went 4lb 12oz which was third in the section. 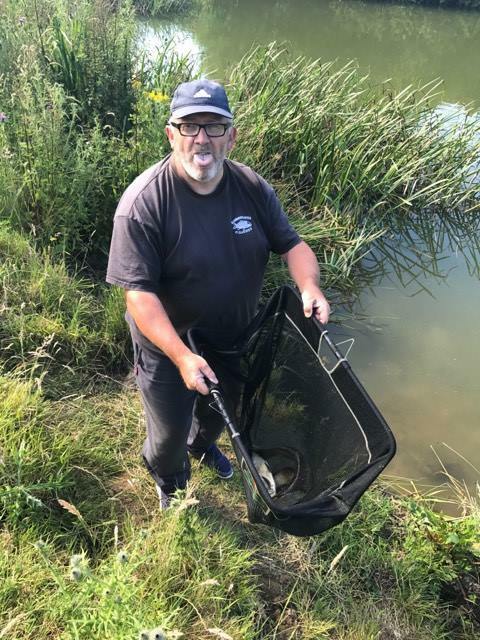 I shouted across to ask what Adie had weighed and he replied 44lb 9oz which is a lovely days fishing, I was a little surprised when he said Bill had weighed 7lb 9oz and he’s caught skimmers and not the bream I thought he was catching. Back at the results and John Dursley was second with 10lb 1oz from peg 11 with Jake Woodard on peg 7 third with 9lb 11oz and Jess sneaked into the final frame place which meant Fieldy got the section money by default and I’d missed out by 2oz! I did have a pound off Steve P although Jeff did a runner without paying. This is what electric shock treatment does for you! So once again all the main weights came from the higher numbers but I was seriously regretting sitting it out for big fish for most of the match when I’m sure I could have caught enough to frame fishing shallow, but then again if I’d landed that chub, things might have been different. It’s definitely an intriguing venue that’s changing all the time, the roach and rudd just aren’t showing in matches but it’s a bite a chuck for pleasure anglers. It’ll be interesting to see how it fishes in the winter.